Most car crashes are caused by driver negligence. Some crashes and collisions, however, are caused by hazardous road conditions on roadways or a dangerously designed and maintained roadway. In such cases, the governmental entity responsible for maintaining or designing that roadway could be held liable as was the case in our two most recent multi-million dollar cases. The first case was won for our client in a wrongful death claim was for over $10 million after a jury trial. The second case was a settlement with Caltrans for over $5 million (Scott Engasser—Please put the appropriate links from the two most recent cases or have it linked to the Result page.). Holding a governing body liable for a dangerous roadway is not easy and it often requires the help and guidance of a skilled and experienced Santa Rosa auto accident injury attorney. In this case, we have” a team of well experienced” attorneys with over forty years of combined personal injury experience. WHAT ARE THE DIFFERENT TYPES OF DANGEROUS ROAD CONDITIONS? Fences, barriers and other road fixtures that are too close in proximity to the roadway. Construction zone negligence-including loose debris. Inadequate signs and warnings, i.e., for flooding. Potholes and other infrastructure deterioration. Potholes and Uneven Surfaces: Potholes in the roadway can damage a car or cause a smaller vehicle, such as a bicycle or a motorcycle, to veer out of control. Uneven and loose surfaces can also cause a vehicle to swerve or have trouble braking. These types of hazardous conditions must be repaired immediately. Defective Design: This could include dangerous slopes, dips and curves to entrance and exit ramps that do not allow for safe merging. The absence of proper signage can also contribute to dangerous traffic conditions and result in a collision accident. Lack of Safety: In some cases, serious pedestrian accidents can occur because there are no crosswalks provided at certain locations. In other cases, although crosswalks are provided, they may not be properly visible to motorists exposing unsuspecting pedestrians to even greater danger. Bicyclists face hazards when there are no bike lanes or the bike lanes are improperly marked or the signage is confusing or nonexistent. HOW CAN I PROVE LIABILITY IN MY NORTH BAY CALIFORNIA DANGEROUS ROAD ACCIDENT CASE? The experienced and highly skilled lawyers at the Law Offices of Michael A. Fiumara can and will answer all of your questions. We understand that dangerous road condition accidents and their subsequent claims can be complex and difficult to understand. We also understand that there is a shortened statute of limitations to get your claim filed timely contributing to greater anxiety for the accident victim. Hence, we will explain your legal options in a very clear and simple way so that the information will be easy for you to understand to make an educated decision on how to proceed. With our dedicated and compassionate attorneys at your side, you will have the ability to make the right decision. Did the condition of the roadway cause your injury? Was the governmental entity aware of the problem and failed to fix or repair it? Was there ample time for the government entity to rectify the problem? Does the location of your accident have a history of injury accidents? If the answer is “yes” to any of the above mentioned questions, the injured victim of the dangerous roadway accident in the North Bay may have a viable claim against the responsible governmental entity. The governmental entity failed to repair the condition within a reasonable amount of time. 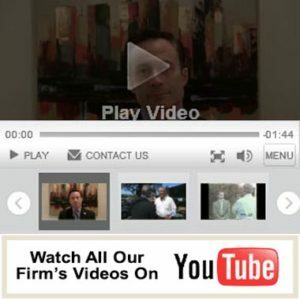 These complex governmental immunity and governmental red tape types of cases takes an experienced and tenacious Santa Rosa injury lawyer and a highly skilled and experienced team of attorneys at the Law Offices of Michael A. Fiumara to successfully pursue a case against the governmental entity which was responsible for your accident. These types of cases almost always involves additional procedures and red tape but our firm leaves no stone unturned and has prevailed in the past. Extensive research in the area of your accident site which leads to evidence of the government’s negligence and failure to repair and fix the roadway. Research the area of the accident through various governmental reports and traffic studies to determine the frequency of similar such accidents as yours. Examine government survey reports and records to determine whether the condition was discovered by the government or could have been discovered by the government. The retention of experts such as civil engineers, road safety specialists, accident reconstructionist professionals, hydrologists, design planners, and others who will examine all of the conditions which led to the accident and provide the winning testimony in court or during depositions. A civil lawsuit against the governmental entity or governing body in charge of a dangerous roadway could result in full compensation for the damages suffered in the crash. Past, current, and future medical expenses. Physical pain and suffering and emotional distress damages. Long-term care, if the injuries are catastrophic in nature. With the high cost of medical treatment coupled together with the repair of your vehicle, the last thing you need is to worry about expenses. Since our law firm operates on a contingency fee basis, you will not have to pay anything until we recover on your behalf and after we win for you! There is zero risk to seeking our assistance. The experienced and highly skilled attorneys at the Law Offices of Michael A. Fiumara have an excellent track record of successfully representing injured victims and their families in cases involving government liability and our record speaks for itself. See Results: (Scott to provide link to personal injury case results).